The new Ashampoo Burning Studio has seen enhancements across the board. Enjoy a more beautiful, intuitive user interface, neat and tidy down to the last feature. Experience better visuals and clarity to the point where everything becomes instantly familiar and usable. Sleek menu paths, self-explanatory icons and a fool-proof layout of all program steps help you always find your way around the program. If you want to create a music collection for your car, you'll often be faced with a problem: Burned to disc or saved to USB stick, nearly none of the available car radios support all sound formats, sorting becomes mixed up and your songs are played in random order. The new Burning Studio puts an end to this! With numerous presets for various radio models, you can now listen to your songs in the way you want to. Making and burning movies has always been the program's specialty. Version 18 now also supports the popular MPEG-4, H.264 and AAC formats. Combined with first-rate new scene transition and sound effects, you now have a sheer endless number of options to create movies exactly to your wishes. There are so many possibilities - let your imagination run wild! There's no limit to your creativity with Burning Studio. Cutting movies is easy and subtitles as text hints, themes or custom graphics help you add individual accents. Turn your photos into slideshows with music to capture your most memorable moments in style or design the perfect cover for your audio CD and use the fascinating mosaic feature or the many presets. You will find that working with Burning Studio is a genuinely fun experience! Burning Studio also offers impressive backup functionality. Burn or save your data how you want it and where you need it. Stunningly simple yet brilliantly implemented technically. And if your files exceed the disk capacity, Burning Studio simply spreads it for your across multiple volumes, automatically. Compression and secure password-protection included! Burning Studio takes to audio files like a duck to water. Rip and store CDs either in high quality or with maximum space savings. Artists and titles are recognized automatically. Then, burn audio CDs with the greatest easy and apply various equalizer presets or volume adjustments before your very own cover design goes into print. Sounds good? It is! Naturally, burning data to CD, DVD or Blu-ray is the core feature of the program. But Burning Studio shows resourcefulness even with such a simple task. Storing huge amounts of data across multiple discs is stunningly simple, autostart discs feature custom menus and individual designs while encrypted discs come with strong password protection for maximum security. Many users are astonished when they work with Burning Studio for the first time. It's that easy? Yes, there's only three steps to the basic work flow: select files, choose a processing method and select a target. Everything else is optional. Creating video DVDs with animated menus in just a few clicks? With Burning Studio, anyone can do it! 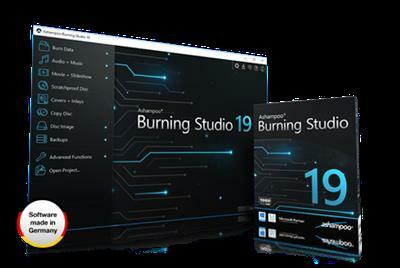 Ashampoo Burning Studio 19.0.0.24 Beta Multilingual | 157 Mb download links are provided by Extabit Rapidshare Uploaded Rapidgator Netload Bitshare Freakshare Letitbit Dizzcloud and more.